Guy Fawkes | When Am I Supposed to Start Feeling Like a Grown-Up? Every year on 5 November we have a fireworks party at our house, for our extended family. The first time we did so our son was a toddler and found the whole idea completely terrifying. So as it was my husband Anthony’s job to set off the fireworks, it was therefore my job to sit in the house with my son, the curtains closed, distracting him till it was all over. So, every year we have a fireworks party at our house, but I never actually get to see the fireworks. This problem pales into insignficance, however, next to the fiasco of the toffee apples. 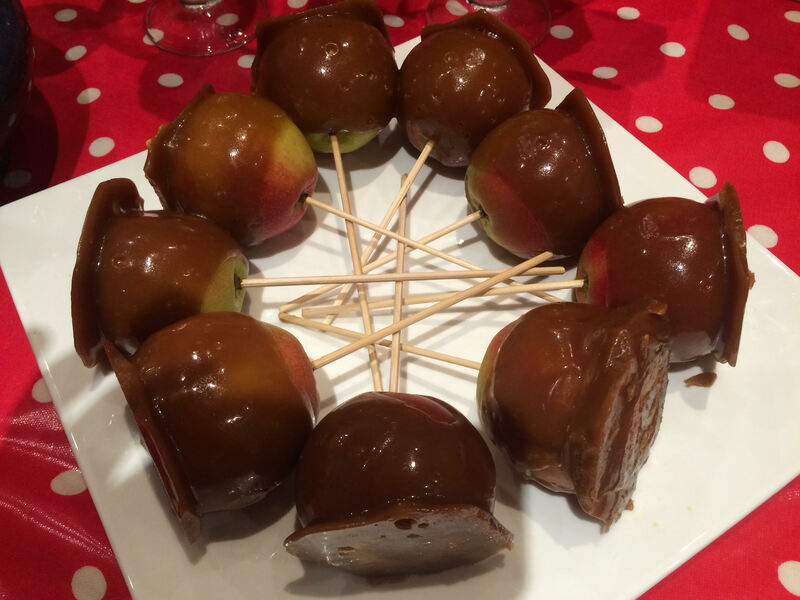 Last year I decided that as it was Bonfire Night, there had to be toffee apples. And buying them from a shop would obviously be far too simple and convenient. Homemade ones were the obvious answer. Anyone who has made toffee will know that it requires your full concentration as you keep an eagle eye on the sugar thermometer while trying not to scald yourself. So, with a house full of excitable kids getting ready for the party and asking questions, what better activity could I have chosen? I got down the 10 litre cauldron we were given as a wedding present, and the satisfyingly enormous wooden spoon that we have to go with it. Into the cauldron went three blocks of butter and two pounds of brown sugar. Thirty minutes later, I had a cauldron of burnt toffee. Naturally, the bin bag melted, and as our kitchen bin has no bottom, vast amounts of molten toffee poured on to the floor. Still I was calm and collected. Clearly, what was left of the bin bag had to be got outside. I doubled it up with another one, then carried it through the house to the dustbin. What I didn’t realise is that the second bin bag had also melted (obviously), so that as I walked I left a trail of toffee all the way through the house, which stuck to the floor like superglue. The only way to get rid of it was to prise every single drip off with a knife. Anthony took the bin outside to clean it, and I’m not sure how he did it, but it involved safety goggles. Amazingly, we are still married. So why exactly do we have a fireworks party every year? I’m really not sure, but it’s possibly something to do with the joyful faces of my older children and their cousins as they oooh and aaah at the magical display in the night sky. I wouldn’t know – I never get to see their faces – or the fireworks they’re ooohing and aaahing at. So what are your Bonfire Night experiences – good or bad? Do let me know in the Comments section! This entry was posted in Bonfire Night, Cooking, Fireworks, Guy Fawkes and tagged Bonfire Night, Children, Cooking, Fireworks, Guy Fawkes, parenting, Parties, Toffee apples on November 8, 2015 by feellikeagrownup.